Whether you are looking to refurnish your house, or just to pick up a blender to make smoothies, the Beit Maimon store on Aliyah Bet Street can probably help. Extensively refurbished after the 2006 Lebanon War, the store offers 3 floors of furniture and electric goods. In 2006, the furniture store was hit by the third katyusha to hit Safed on the first day of the war. Fortunately it only damaged the top part of the building, and no one was injured. After the explosion the street was full of clouds of smoke and debris. Various government ministers came the next day to see the damage and the incident even made the TV news headlines! After the war the company refurbished and redesigned the interior of the store as part of the rebuilding process. Recently combined with the 10 Electric company, Maimon's now offers an even wider selection of electrical goods. Here you will find brand names you are used to like AEG or Samsung as well as Israeli brands like Amcor you may not be so familiar with. While of course you will want to comparison shop, Maimon's prices are competitive and they offer one of the largest selections of goods in the city. They will of course deliver (for a small charge) and it is possible to pay in installments. In fact the prices on many of the goods actually tell you the installment plan available, which means you don't need to be embarrassed to ask about the details. Most of the staff speak basic English and will be able to help you with your selection and explain any payment terms to you. 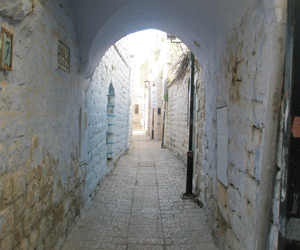 It is usually impossible to park in front of the store as the street is one of the busiest in Safed, but there is nearby metered city parking available up the street. Beit Maimon, 8 Aliyah Bet Street, Safed.